Blood is one of those games that many newer gamers stumble upon and assume it's an obscure hidden gem. Considering it got a sequel many years before Duke did (and SW, if you count the 2013 reboot) and received several expansion packs it was fairly well known. 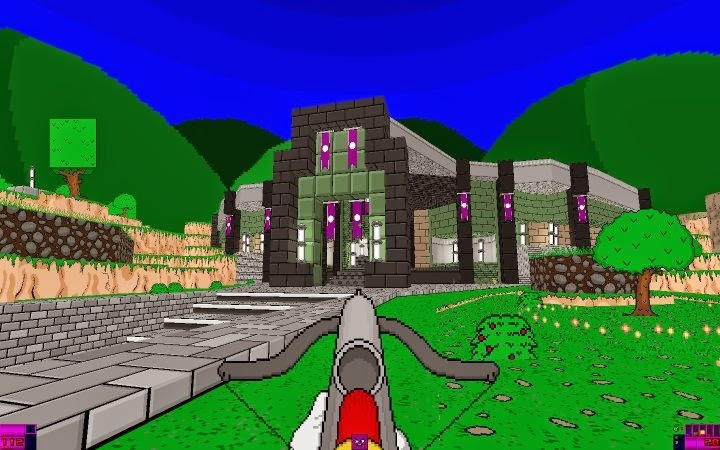 Having said that, if you're reading this and haven't heard of it for some reason, Blood is a Build engine game by Monolith. Duke's theme was an alien invasion, Shadow Warriors a Kung-fu film, and Blood's was a pulp-horror theme. 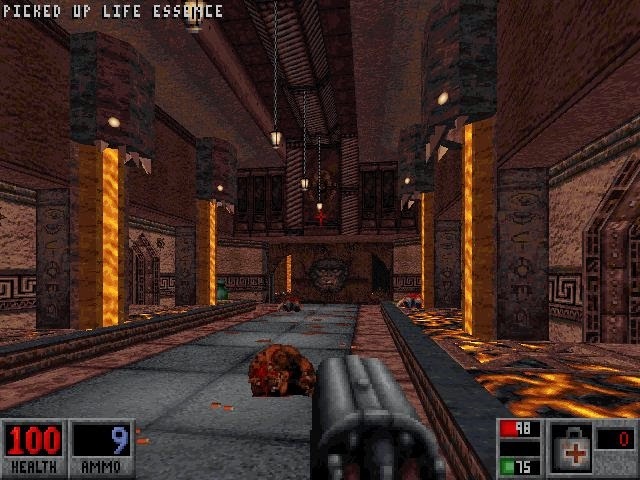 Deathwish is a full campaign of over 30 levels for Blood, and one of the best mods I've ever played. Made solely by Bloatoid, Deathwish is set long after the events of Blood. Tchernobog (the badguy of Blood) is back, and Caleb's job is to travel through 3 full length episodes to defeat his arch-nemesis once again. The story is delivered through new cutscenes at the start and end of each episode, but more importantly it's also delivered naturally in-game. More on that later. First of all, I can only envy Bloatoid's work on the levels, and the fact it took him barely 2 years to produce all of this amazing content. 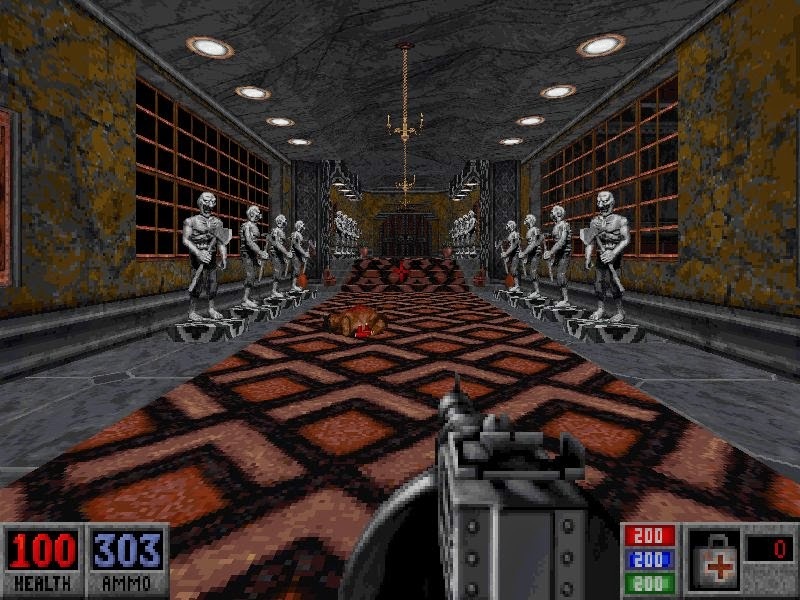 Each level is a sheer joy to look at and play, with the only shame being that due to the lack of a sourceport if you're not well versed in DosBox or retro play than more likely than not you'll be forced to play this at either a sub-par resolution or framerate. That's nothing to do with the author however since it plagues the entirety of Blood, not just Deathwish. Caleb's journey takes him through a massive array of locations, from standard Blood fare like castles, mines, and ancient cult hideouts (although anything but standard looking) through chilly Thing-inspired arctic outposts, Desert convoys, space-stations, a grapery, a sea-side resort, a silent-hill style town...the amount of themes is vast but most importantly, it never feels gratuitous. Every level naturally flows from one to the other...even the secret levels once beaten actually lead to a further remixed version of the level you entered it from, to resume the natural progression of the pack. Despite using no new textures, Bloatoid puts all of blood's textures to hard work creating a rich atmosphere (rich is fairly pretentious but literally the only way I can think of describing it) It's not just the visuals of the levels however, because nearly all of them have a great scripted sequence or impressive explosion to balance them out and if they don't than even just the atmosphere is enough to keep you moving forward. Tied into this is the mod's storyline and plot - throughout the entire mod you see visions of Tchernobog's prescence, and he'll create traps and hurt the player. There's brief tomes that literally contain a single sentance of text, but they still help set the mood and foreshadow whatever may be around the corner. Deathwish communicates it's relatively simple story well and thorughout the levels, and even uses existing quotes from Caleb in natural ways to help seal the deal on the plot and what's going on. It's a masterful use of the game's default resources to provide exposition in a way many retail games still stumble poorly. It's not terribly complicated, but it's executed well and pushes you onwards. So far it's all gushing praise for Deathwish...and that's really all I can offer, because apart from a few levels that aren't quite as interesting as the rest (The spacestation, whilst well executed, I didn't find too compelling) it's just completely solid all the way through and goes from strength to strength, with constant new ideas and challenges to go through. Most importantly, it's clear the amount of love that went into the mod. Nothing feels rushed or lazy and even the full walkthrough provided shows that Bloatoid thought about the players who aren't so hot with finding secrets or navigating the levels. 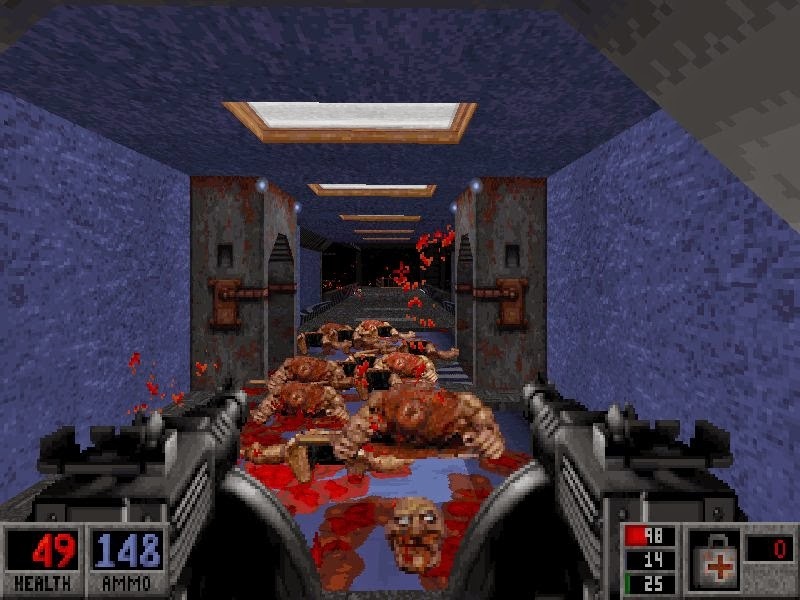 This could of easily been packaged and sold as a retail expansion of Blood, had it been released back in the day. At first glance the very basic art-style may throw you off, but after playing for a few minutes it's very clear it's not a gimmick. Everything is put together so well that it feels really solid and it only takes a couple of minutes to get into the groove of the game. The basic setting is that you're Square, and you have to rescue Dr. Octagon from the Circle of Evil. That's essentially it, but you're barking up the wrong tree if you're looking for Hemingway in a Doom mod anyway. 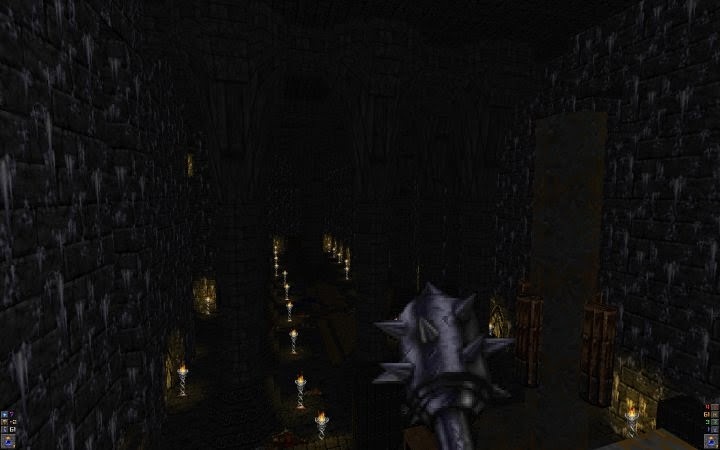 Hexen was an odd one to me. It had a combination of really cool things (multiple characters each with their own weapon set, really good artwork and atmosphere) and a bunch of horrible things (that terrible initial level set, a mere 4 weapons per character in a melee-heavy game) that prevented it from being amazing. The potential was there, but I felt it was never really realized until Ultimate Doomer released his Serpent Resurrection mod. 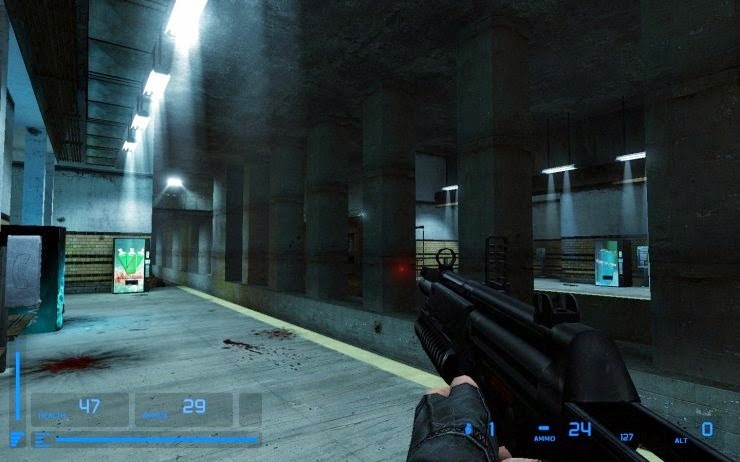 When you see a mod with ambitions to rival those of retail games and action movies, do you roll your eyes? I've been burnt far far too many times now to ever get hopes up for a mod (Dark Truths, a Half-life mod which promised the world, was probably the bitterest of mod cancellations for me. Nightwatch's eventual closure afterwards didn't sting nearly as much) The list of mods that seemed to have an insane feature list that not even AAA devs bother with is still somewhat big (and that's more of a damning indictment of the state of AAA FPS development) but every now and then a mod pulls through and actually sees release. And sometimes, they not only live up to but completely exceed expectations in every way imaginable. Underhell has that incredibly rare accolade.